Packaging dedicated to automotive electronics is growing and will reach US$7B in 2023. Despite the high degree of regulation, consumer packaging types are slowly adapted to, and adopted by, the automotive market. The big winners of diversification and the increase of electronics in the automotive market are the OSATs. 20th Electronics Packaging Technology Conference – Feel free to attend Santosh Kumar’s presentation during the Plenary Session 2: Packaging for next generation automobiles/autonomous vehicles, on December the 5th at 4:00PM – More info. 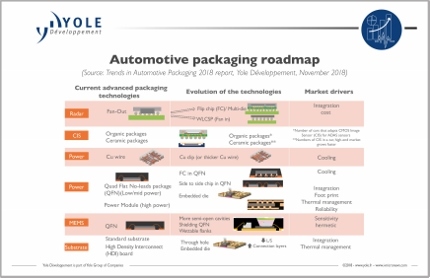 LYON, France – November 21, 2018: “Automotive is the new El Dorado for microelectronics,” announces Emilie Jolivet, Director, Semiconductor & Software at Yole Développement (Yole).The market is showing significant market drivers that are daily supporting the growth: electrification, connectivity, autonomy and comfort are the key words of the today’s automotive industry. In addition, for the first time in history, a big effort is made to adapt consumer technologies to the automotive sector. Although the main platform in term of units is the WBBGA package, which represents half of the market, advanced packaging platforms such as flip-chip and fan-out are finding their place. The next packaging innovation expected is embedded die in substrate for converter dies. Packages like QFN package, iBGA Package and ceramic packaging are also growing for specific applications like CIS , MEMS and power devices. These results will be presented by Santosh Kumar, Principal Analyst & Director Packaging, Assembly & Substrates, Yole Korea at the 20th Electronics Packaging Technology Conference (EPTC). This presentation will take place on December 5th at 4:00 PM during the Plenary Session 2, titled Packaging for next generation automobiles/autonomous vehicles. Make sure to attend this presentation and discuss with our expert and feel free to visit also our team in the exhibition area (Booth #19).